In metalworking, rolling is a metal forming process in which metal stock is passed through one or more pairs of rolls to reduce the thickness and to make the thickness uniform. Rolling is classified according to the temperature of the metal rolled. If the temperature of the metal is above its recrystallization temperature, then the process is termed as hot rolling. If the temperature of the metal is below its recrystallization temperature, the process is termed as cold rolling. In terms of usage, hot rolling processes more tonnage than any other manufacturing process, and cold rolling processes the most tonnage out of all cold working processes. The invention of the rolling mill is attributed from Leonardo da Vinci.Earliest rolling mills were slitting mills, which were introduced from what is now Belgium to England in 1590. These passed flat bars between rolls to form a plate of iron, which was then passed between grooved rolls (slitters) to produce rods of iron. Later this began to be rerolled and tinned to make tinplate. The earlier production of plate iron in Europe had been in forges, not rolling mills. The slitting mill was adapted to producing hoops (for barrels) and iron with a half-round or other sections by means that were the subject of two patents of c. 1679. Some of the earliest literature on rolling mills can be traced back to Christopher Polhem in 1761 in Patriotista Testamente, where he mentionsHistory of the is wanted to tilt only one bar with a hammer. A patent was granted to Thomas Blockley of England in 1759 for the polishing and rolling of metals. 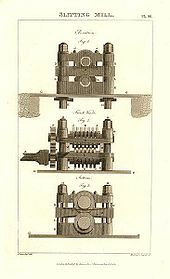 Another patent was granted in 1766 to Richard Ford of England for the first tandem mill. A tandem mill is one in which the metal is rolled in successive stands; Ford’s tandem mill was for hot rolling of wire rods. Modern rolling practice can be attributed to the pioneering efforts of Henry Cort of Funtley Iron Mills, near Fareham, England. In 1783 a patent was issued to Henry Cort for his use of grooved rolls for rolling iron bars. With this new design mills were able to produce 15 times the output per day than with a hammer. 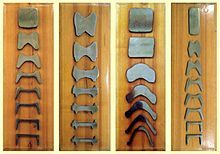 Although Cort was not the first to use grooved rolls, he was first to combine the use of many of the best features of various ironmaking and shaping processes known at the time. Thus modern writers have called him “father of modern rolling." The first rail rolling mill was established by John Birkenshaw in 1820, where he produced fish bellied wrought iron rails in lengths of 15 to 18 feet. With the advancement of technology in rolling mills the size of rolling mills grew rapidly along with the size products being rolled. Example of this was at The Great Exhibition in 1851 a plate 20 feet long, 3 ½ feet wide, and 7/16 of inch thick, weighed 1,125 pounds was exhibited by the Consett Iron Company. Further evolution of the rolling mill came with the introduction of Three-high mills in 1853 used for rolling heavy sections. Hot rolled metals generally have little directionality in their mechanical properties and deformation induced residual stresses. However, in certain instances non-metallic inclusionswill impart some directionality and workpieces less than 20 mm (0.79 in) thick often have some directional properties. Also, non-uniformed cooling will induce a lot of residual stresses, which usually occurs in shapes that have a non-uniform cross-section, such as I-beams. While the finished product is of good quality, the surface is covered in mill scale, which is an oxide that forms at high-temperatures. It is usually removed via pickling or the smooth clean surface process, which reveals a smooth surface.Dimensional tolerances are usually 2 to 5% of the overall dimension. Hot rolling is used mainly to produce sheet metal or simple cross sections, such as rail tracks. 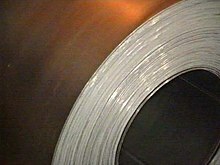 Other typical uses for hot rolled metal includes truck frames, automotive wheels, pipe and tubular, water heaters, agriculture equipment, strappings, stampings, compressor shells, railcar components, wheel rims, metal buildings, railroad-hopper cars, doors, shelving, discs, guard rails, automotive clutch plates. Cold rolling occurs with the metal below its recrystallization temperature (usually at room temperature), which increases the strength via strain hardening up to 20%. It also improves the surface finish and holds tighter tolerances. Commonly cold-rolled products include sheets, strips, bars, and rods; these products are usually smaller than the same products that are hot rolled. Because of the smaller size of the workpieces and their greater strength, as compared to hot rolled stock, four-high or cluster mills are used.Cold rolling cannot reduce the thickness of a workpiece as much as hot rolling in a single pass. Cold-rolled sheets and strips come in various conditions: full-hard, half-hard, quarter-hard, and skin-rolled. Full-hard rolling reduces the thickness by 50%, while the others involve less of a reduction.Skin-rolling, also known as a skin-pass, involves the least amount of reduction: 0.5-1%. It is used to produce a smooth surface, a uniform thickness, and reduce the yield point phenomenon (by preventing Lüders bands from forming in later processing). It locks dislocations at the surface and thereby reduces the possibility of formation of Lüders bands. To avoid the formation of Lüders bands it is necessary to create substantial density of unpinned dislocations in ferrite matrix. It is also used to breakup the spanglesin galvanized steel. Skin-rolled stock is usually used in subsequent cold-working processes where good ductility is required. Typical uses for cold rolled steel include metal furniture, desks, filing cabinets, shelves, tables, chairs, motorcycle exhaust pipes, computer cabinet and hardware, all home appliances and components, shelving, lighting fixtures, hinges, tubing, steel drums, lawn mowers, electronic cabinetry, lighting fixtures, water heaters, metal containers, and a variety of construction related products. Foil rolling is a specialized type of flat rolling, specifically used to produce foil, which is sheet metal with a thickness less than 200 µm (0.0079 in). The rolling is done in a cluster mill because the small thickness requires a small diameter rolls. To reduce the need for small rolls pack rolling is used, which rolls multiple sheets together to increase the effective starting thickness. As the foil sheets come through the rollers, they are trimmed and slitted with circular or razor-like knives. Trimming refers to the edges of the foil, while slitting involves cutting it into several sheets. Aluminum foil is the most commonly produced product via pack rolling. This is evident from the two different surface finishes; the shiny side is on the roll side and the dull side is against the other sheet of foil. 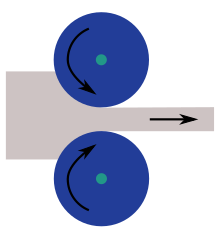 Ring rolling is a specialized type of hot rolling that increases the diameter of a ring. The starting material is a thick-walled ring. 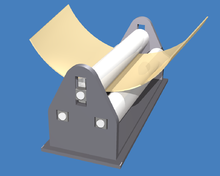 This workpiece is placed between two rolls an idler roll, while another roll, called the driven roll, presses the ring from the outside. 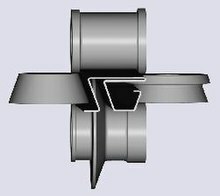 As the rolling occurs the wall thickness decreases as the diameter increases. The rolls may be shaped to form various cross-sectional shapes. The resulting grain structure is circumferential, which gives better mechanical properties. Diameters can be as large as 8 m (26 ft) and face heights as tall as 2 m (79 in). Common applications include rockets, turbines, airplanes, pipes, and pressure vessels.